It's been an exciting time for fans of The Fantasy Trip! 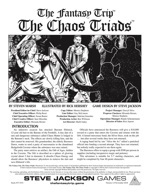 Following a successful Kickstarter earlier this year (and a couple issues of Pyramid with TFT adventures and support), we're now proud to present the first full TFT adventure supplement in decades: The Chaos Triads. Written by Yours Truly (longtime Pyramid editor Steven Marsh), The Chaos Triads sets the heroes on a quest where the situation has gotten more complicated than anyone knows, and the edges of life and death are blurring almost as much as reality itself. This adventure includes new ready-to-print counters and megahex tiles, a new monstrous threat that pushes the boundaries of the possible, and (of course) maps to make the dungeon come alive. And the format is digital, so you could be reading it within minutes! Get your copy of The Chaos Triads today, thanks to Warehouse 23!